Urmston-born, Dave Waller joined Dario Gradi's Crewe academy and turned pro with the Gresty Road outfit in 1982. Fifty-five goals came at around one every three games before he was sold to Shrewsbury for £20,000 in 1986. 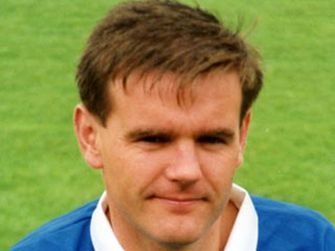 Within a season the Gay Meadow side had written him off as injured and incurable, and were no doubt chuckling about getting a precious £3,000 out of hard-up Chesterfield for him. Dave was the last player signed by John Duncan at the end of his first spell in charge. Given the Scot's reputation for dour, defensive play, it is hugely ironic that injury deprived the club of Waller's exciting, prolific talent until after Duncan's departure for Ipswich. Despite a seemingly constant struggle against injury, Dave was a revelation to Town fans, who had become rather unused to the sight of an accomplished goalscorer plying his trade. He shielded the ball well, and had the knack of turning opponents and putting in a spurt of pace to create his own chances. Dave scored thirty-seven of his goals in two seasons of struggle for the team: in the 88-9 relegation season he equalled Jimmy Cookson's record of scoring in eight successive League games. Fans speculated as to Dave's value to a successful side: they were given the chance to assess that the following season, as he found the net sixteen times as the team challenged for promotion from the Fourth. Christmas 1989 was a good time to be a Town fan and, as the clock ticked on towards midnight on December 31st.,the customers that packed out the Poplar pub in Old Whittington managed a quick 'Auld Lang Syne' in between lengthy and lusty choruses of "Ooh, Waller Waller!" As the club approached its first Wembley appearance, disaster struck. Dave injured a knee, but struggled on, managing to get on as a sub in the play-off final as the team desperately sought to get back into the game. Damage to the cruciate ligament was confirmed, a possible move to Grimsby fell through and, despite every effort from club and player, he never made the first-team again. Dave's last act in a blue shirt was to miss a penalty in a shoot-out at the end of a reserve game many months later. He recovered enough fitness to do the rounds of local non-League teams while running a stall on Chesterfield's market, and was appointed Player/manager at Glapwell in 1993: under his influence, the team rose from the Central Midlands League to the Northern Counties (East). Dave retired from football at the end of the '97-8 season. Living locally, Dave retains links with and an affection for The Spireites, and is often spotted at the Proact Stadium. For Chesterfield: 117+2 League appearances, 53 goals.